Trearddur Bay enjoys a wonderful setting on the west coast of Holy Island , a sheltered and sandy bay, suitable for families, set into a rocky coastline and cliffs, two miles south of Holyhead. The resort has a selection of hotels, pubs, cafes, restaurants and shops, together with a seafront promenade and offers convenient beachside car parking. 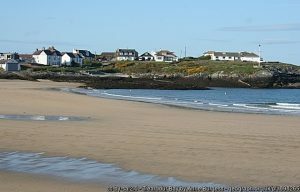 It is very popular for sailing, diving and other water sports and there is fine sea fishing to be had at nearby Mackerel Rock, The Holyhead Golf Club is also sited at Trearddur Bay. Facilities for squash and horse riding are also available, as well as a snooker hall at the Beach Hotel..
Trearddur Bay offers excellent walking, with a sweep of low, grassy coastline around the bay. Walks are also popular along the low level cliffs to the north and south of the resort. There are many other attractive small beaches, coves and bays, such as Porth Dafarch (which was considered as an alternative site for berthing Irish packet boats in the early 19th century, prior to the construction of Holyhead’s harbour). Trearddur Bay and Porth Dafarch are both award winning beaches.